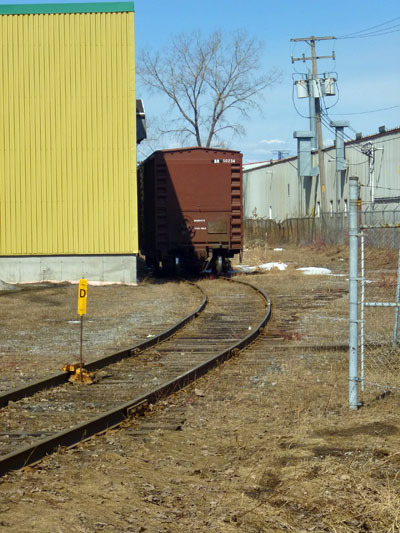 Thursday morning I decided to walk south and visit an industrial area near a railroad yard in Quebec City. I’m something of a train nut and I thought maybe I could sketch some trains. I was walking to the freight yard when I happened upon this scene. I liked the yellow wall, juxtapositioned next to the brown train car and the harsh shadow between them, so I decided to sketch it. I set up to the left of where this photo was taken, on a sidewalk, with the street behind me. My WalkStool was actually straddling the railroad track. Those railroad tracks crossed the street and went somewhere. I didn’t pay much attention. I remember chuckling to myself that at least this subject wouldn’t drive away like a car I was sketching earlier in the week. I was having a really nice time as the sun felt good, it was quiet, and the sketching was going well. I’m a really slow sketcher so I’d been there more than an hour and I was intently adding color to my ink sketch. I was so concentrated on the work that I didn’t even hear it… until a guy walked up to me and his shadow crossed my paper. “Qu’est-ce que tu fait, Monsieur?” (What are you doing, Mister?) I looked up to see a guy in overalls and a baseball cap staring down at me. And then I saw IT. 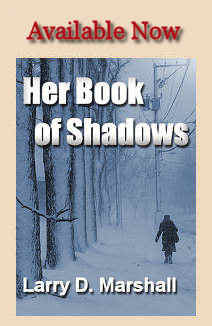 It was an EMD SW-1500 switch engine, idling no more than ten feet from where I was sitting – on the railroad tracks. I told him I was sketching and showed him my sketch. I stood up as I did and he told I’d have to move. As I was packing up he walked over to the derail (that yellow thing clamped to the track), disengaged it, and motioned to the engineer to move forward. By then I was taking photos of the engine. I did mention that I’m a railroad geek didn’t I? Once they’d engaged the boxcar, the guy dropped off the engine, walked back to me, and asked if I could show the engineer my sketch. I was both amazed, excited, and nervous all at once. 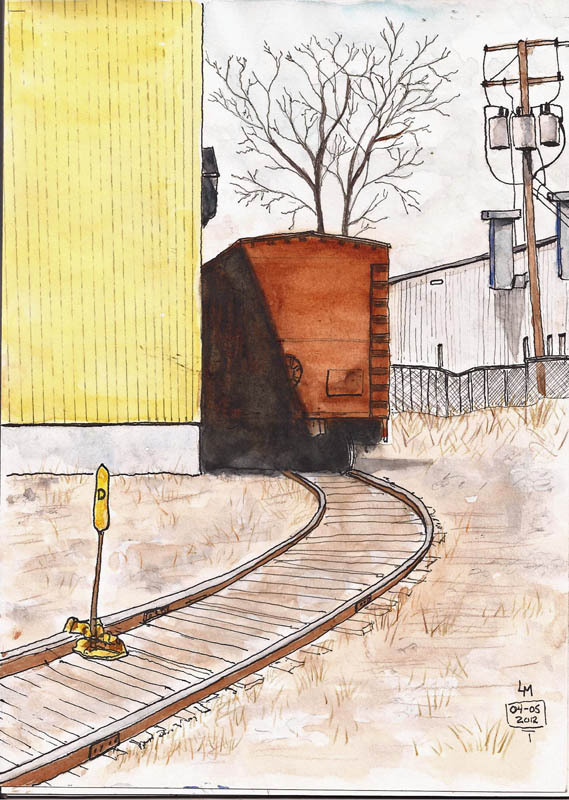 The sketch you see below bought me access to the cab of that engine, which for a railroad geek is a really big deal. And then they hauled my boxcar away. And that, my friends is what I call a great day of sketching. Here’s the sketch. I still have to add the white letters on the boxcar and I’ll probably do that with a colored pencil. This sketch was done in my Stillman & Birn Alpha sketchbook (10×7), using a Lamy Safari XF and Platinum Carbon Black ink. Color is W&N artist watercolors. Has anything like this happened to you while you were sketching? Glad they didn’t run you over. You did such a nice job on the sketch. I can make you a little envious. I got to ride in the engine and pull the whistle! What a great story and an excellent example demonstrating the “currency” of sketches. Thanks, everybody, for your comments.